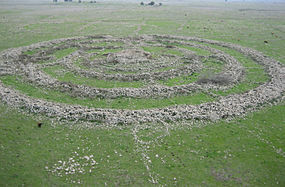 On a wide plateau in the Golan Heights region lies the ancient, mysterious rock structure called the Gilgal Refaim. Although it is millennia old, very little is actually known about the Gilgal Refaim or those who built it. Gilgal in Hebrew translates to circle. Refaim translates to ghosts. However, according to legend, Refaim was also a race of giants who lived in the Bashan (present-day Golan Heights). To this day it remains a mystery to historians, scholars, and archaeologists. We do not seek to solve the mystery—we embrace it. May the Giants be with you always. It doesn’t get any better for Tesco, who have seen their ‘big price drop’ flop, sales and profits drop, the worst perfromance of the ‘big four’ over Christmas, their share price plummet, their UK operations CEO sacked, their local management in a spin, all since announcing a £30,000 gift to London Gay Pride in November 2011. … Now it’s an infestation of mice in Tesco’s flagship Tesco Metro in Bedford Street in London’s Covent Garden. … Nothing has gone right for Tesco since they decided to support ‘gay pride’. Their only hope is to repent of that decision and put their trust in God.